The Zumba Team Building activity comes straight from Colombia. You will be transported by the bright and wild rhythms of this Latin dance. Your team will be able to let off steam and have fun. 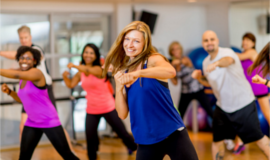 In addition to improving your mood, this dance will allow you to unwind and develop your sense of rhythm as well as your artistic side as a group! The Zumba Team Building activity forces the group to perform and work as a team. Completely absorbed by the action, the participants gain confidence, feel liberated and experience new emotions together. This activity uses fun to create real team spirit.